This recipe for bacon bombs was inspired by two things. First, a friend on Facebook who gave me the idea for this recipe. Second, is the fact that I love to take recipes like this and make them my own. I changed the original around and made it with turkey instead of beef. This changed things up a bit and make it interesting. Several of the ingredients from the original recipe were removed. I kept the mushrooms and onion, and then added turkey, kale, Italian bread crumbs, and salt and pepper. The sweetener was left out as was the soy sauce, and I used barbecue sauce instead of ketchup. I also felt that for two people, you only really need to use one yellow onion. It is easy to get the first couple of layers off to use as your meat casing. You can find the original recipe here if you are interested. I am always looking for new and interesting things I can cook outside. 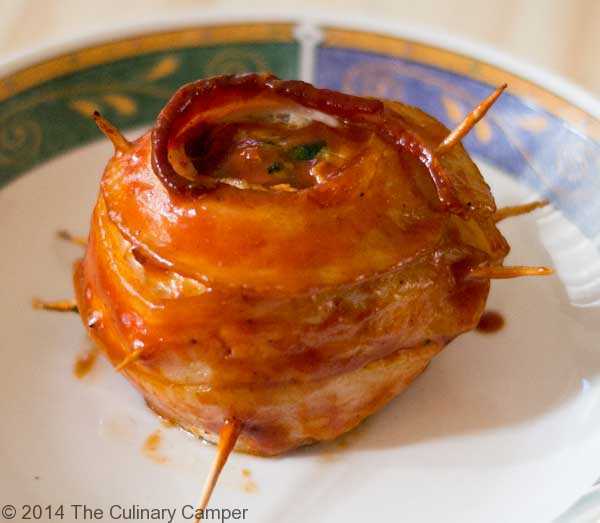 These turkey onion bacon bombs appeared to be the perfect 4th of July feast on my grill. 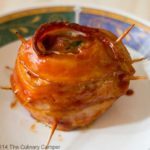 The bacon bombs are easy, can be prepared well ahead of cooking time, and are fun to make. Bacon bombs are a great item to cook on your grill, but these would be great any time of year in cooked in your oven. 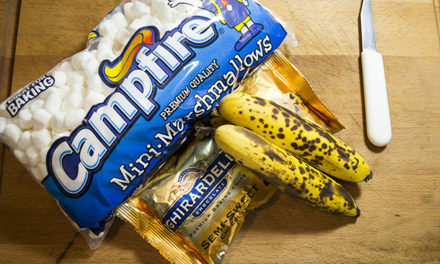 You could even make these in a Dutch oven over a campfire. Just imagine what a hit these would be around a campfire. When you make bacon bombs, be sure you have plenty wooden toothpicks on hand. This is the best way to secure the bacon to the onion. Do not be afraid to have several toothpicks sticking out. You can use either thick cut bacon or thin cut, however, if you like your bacon cooked crisp, you should think about using thin cut bacon. 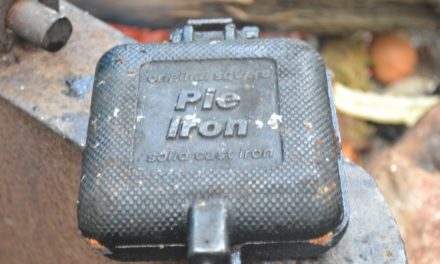 Having a cover also helps to fully cook the meat all around. Make sure your grill has a cover or make some sort of foil cover. Bacon bombs are great with any type of ground meat. You can use chicken, turkey or beef or some more exotic meats like venison if you prefer. It is also really easy to increase this recipe to feed more people. You should plan on one to two bacon bombs per person. I was only able to eat one myself, however, my guest was able to eat more. If you plan on serving more than two people, I recommend using at least one more onion. You will only use the larger outer layers of the onion for the casing. You can use either barbecue sauce or ketchup, it is purely a matter of preference. For the bacon bombs in these photos, I used barbecue sauce. Ketchup is good too, but I love barbecue sauce when I am grilling. It is also nice to put the sauce on in the last 5 minutes of cooking so that it can caramelize a bit. Caramelizing the bombs in the last few minutes of cooking is the way to go for full flavor. I tend to serve a little extra sauce with this dish as I like a lot of sauce. Want to turn these into something healthy, just use turkey bacon instead pork bacon, and you can turn this into something delicious and healthy. If you love bacon, be sure to check out my recipe for Bacon Breakfast Cups. This is a delicious way to start your morning. Delicious individual meatloaf, wrapped in bacon and grilled to perfection. Cut off the tops and bottoms of the onions, and remove the exterior skin. Cut down the middle of the onion and peel the outer layers off. Chop the insides of the onion for the meatloaf. Set the onion layers aside, mix the turkey, chopped onion, parsley, mushroom, kale, Worcestershire, bread crumbs, salt and pepper in a large mixing bowl. Place a handful of the meat mixture inside one of the onion layer halves. Grab the other side of the onion and fill until the inside is full, but not overflowing with the meat mixture. Wrap the onion balls in bacon. Secure the bacon with toothpicks to keep it from unraveling during cooking. You may need to use quite a few toothpicks to keep the bacon in place. Place the bacon bombs in a dish, and place on the grill over indirect heat. Bake on the grill at 425 °F for 40 minutes. Cover the balls in BBQ sauce and bake for an additional 5 minutes. Serve with extra sauce.